Taproots are dropped by spriggans. Taproots have all the same effects as Dwarven oil, allowing you to make a potion with all four effects. Taproots are dropped by all varieties of spriggan, including spriggan matrons and spriggan earth mothersDG. Healing a HouseDB: Help Elynea Mothren repair the tower of Tel Mithryn. Three samples are needed for this quest. Contrary to what is stated in the official Game Guide, spriggans only drop taproot, and never drop spriggan sap. 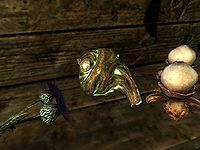 This issue has been addressed by version 2.0.0 of the Unofficial Skyrim Patch; both ingredients can be dropped when spriggans die. Frequently, objects which look exactly like Taproot are found apparently used as light sources. Most often they are seen in camps such as those inhabited by the Forsworn. These cannot be picked up or interacted with in any way, however.